Sama Zama » Why do you read anime blogs? Why do you read anime blogs? [EDIT:] Oops, forgot to add the actual poll! So what do you look for in an anime blog? Do you read blogs for screenshots? Or just to see what a blogger’s opinion might be on an issue or anime? What do you enjoy the most about your favorite blogs? 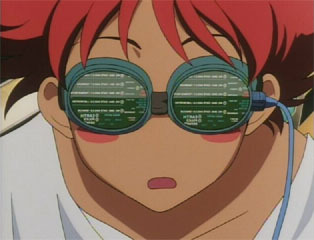 Along the lines of lazy blogging, how important do you think it is to write a summary for each anime episode? Writing summaries is the most boring thing on the earth to me, since I would rather just write my commentary and be done with it. But summaries might really be appreciated by readers. I don’t know. Maybe people want to spoil themselves? I’m not exactly sure what most people look for when they read my blog or another’s. I know when I first read blogs, I was trying to find info on particular series, deciding whether they would be worth watching or not. Or sometimes I would look ahead to future episodes to see if a series was worth continuing to watch. Later, I began reading blogs more for their commentaries on episodes interesting to me than for the screenshots or summaries. Blogging is a hobby for me, but blogs are still meant to be read, so I want to write as well as I can and try to improve. :) I won’t change my entire style according to poll results, but I would like to know what readers look for. So I guess we’ve come to a consensus, huh? Fantasy loli for all! 60% is a fairly solid majority. I’m glad some people did think pedophiles were just misunderstood, since where would we be without guys like abq? I think I would just drop to the floor, spasm, and then die. Alright, not really. Anyway, this topic generated a greater reaction than I thought it would, and I was told by Wyk72 that pedophilia is a hot topic in Europe right now.